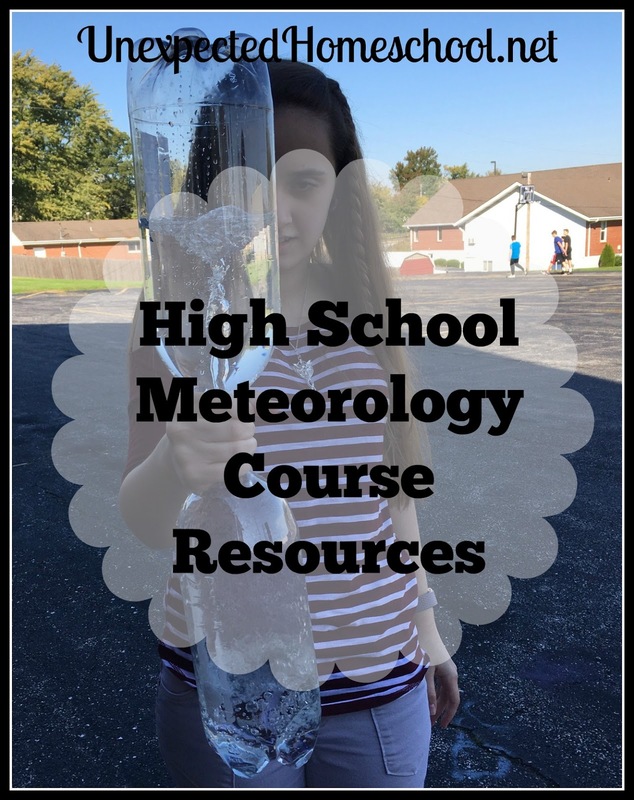 This semester at our homeschool co-op I have been teaching a semester long, high school level meteorology course. The course is not math based, so there are no calculations other than basic operations. Our students in the co-op are at varying math levels, and it was easiest to provide a non-math based course. My tenth grade daughter has been the motivation for the course, having requested it be one of her sciences for high school. She has significant anxiety and difficulties with math at this point, so I was highly motivated to make meteorology interesting and factual, yet not heavy in math. During the week, the students work on an assigned reading selection from the primary book listed in the resources below. They then have vocabulary and questions to answer from the worksheets in the teacher guide. Additionally, they work on lab reports and questions from our previous class period. Our class periods are spent reviewing their reading, and delving into the topics more fully. Each week there is also a laboratory portion where the students usually conduct their own experiments or build their own weather instrument. Many of the lab / investigations have been taken from a kit I purchased from Amazon, although I did need to purchase additional supplies so that my entire class could work on the experiments at the same time. Other projects and investigations came from the final book listed in the resources. This book was not only a good source of projects, but had some helpful explanations that were not provided in the other resources. I had actually planned for all of the laboratory portion to come from the Weather Projects for Young Scientists book, however I discovered the weather kit at the last minute that made everything simpler and provided lab question sheets. Our class was also fortunate enough to be able to take a field trip to the National Weather Service office in our area. It is close to all of us, and they offer free tours for educational groups. This was a fantastic way for the students to see what they were learning used in practice. As a final project, the students have taken weather readings with the instruments they created and recorded the information for several weeks. One day each week the students attempted to forecast the weather based on several days worth of recordings. Of course, we do not have the benefit of upper air readings, however we can take the current weather and make predictions of change. The New Weather Book - from Master Books. sounds like you put together quite the interesting class for them.